Studying for any exam requires tremendous time, dedication and efforts. The Project Management Professional exam is tougher than the most exams and requires immense preparation and diligence. PMP® certification is recognized as the Elite certification for project management professionals. Acquiring this certification opens doors to new opportunities and also makes you a favorable candidate to trust higher responsibilities. PMP® is administered by the Project Management Institute, and is the most officially recognized project management certification worldwide. A Guide to the Project Management Body of Knowledge (PMBOK® Guide) which is issued by renowned project management body- Project Management Institute. It is considered as a valuable tool for those who are preparing for PMP® certification. Learning the concepts of PMP® Exam would not only boost your career but also enable you to handle the critical projects. PMP® certification is based on PMBOK® Guide and mastering this magic book can surely help you pass the PMP® certification on the first try. Getting PMP® certified may seem to be a daunting task for many. However, if you approach with a right strategy, the process can become much simple and easy for you. PMP® Exam quick study guide can prove out to be extremely beneficial if you are aiming to pass the test on the first try. PMP® Quick Study Guide is a 82 pager special notes book which is specially curated for PMP® aspirants to recap all the 978 pages PMBOK® Guide Definitions, Terms, Formulas in a view within just 60 minutes. When your exam date is approaching and you do not have the time to go through the mighty PMBOK® Guide, in that case, PMP® Quick Study Guide can come really handy. As mentioned earlier, it will give you a quick recap of the 978 pages PMBOK® Guide in just 60 minutes. PMaspire is the world’s richest e-Learning and exam simulator platform that can help PMP® aspirants pass the PMP® Exam easily. 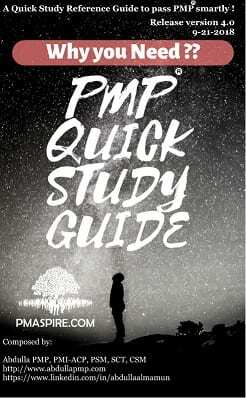 Visit the website today to get more details about the PMP® Quick Study Guide.